WP-SmugMug integrates your SmugMug galleries into your Posts and Pages on your WordPress blog. Due to changes in WordPress and SmugMug’s API’s, this plugin is no longer actively maintained. Download the current version of WP-SmugMug (2.0.7). When the WP-SmugMug plugin is installed and activated, a new panel will appear in your Post or Page edit screen. You use this panel to enter and insert information about your SmugMug gallery into your post. RSS feeds are only available on publicly listed galleries. If for some reason WP-SmugMug cannot access the gallery’s RSS feed, a link to the gallery will be displayed in its place. This is an optional title that will be displayed above the gallery thumbnails. This is an optional description that will be displayed above the gallery thumbnails and below the title. By default, SmugMug RSS feeds only return the first 100 photos. Use this parameter to set the number of photos you want to return from your gallery. You can set WP-SmugMug to start at a particular photo in the gallery. Enter a number greater than zero. 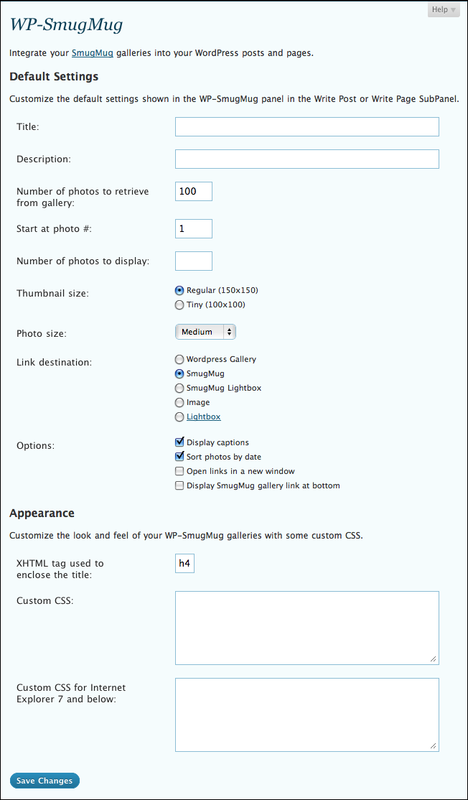 Set the number of photos to be displayed in this call to WP-SmugMug. For instance, you may want to display the first four photos at the beginning of your post, followed by the remaining set of photos at the bottom of your post. To do this, you would use the [smugmug] shortcode twice in your post. This is the beginning of my post. Choose to display the regular size thumbnails at 150×150 or the tiny thumbnails at 100×100 pixels. This option sets the image that will be displayed when the user clicks on a thumbnail. Note that if you choose WordPress Gallery as the Link Destination below, you must make sure that the Photo Size fits within your site’s template. Choose how what happens when the thumbnail image is clicked on. Display the captions, sort the photos by EXIF date, set the browser to open a new window when clicking on the thumbnails and display a link to the image gallery at the bottom of the page. Finally, click on the Send to Editor button to insert the WP-SmugMug shortcode into your post. You may place the shortcode wherever you want the gallery thumbnails to appear. Click on Settings->WP-SmugMug 2 to bring up the WP-SmugMug Admin Panel. Here you can change the default settings which are displayed in the Post or Page Edit screen. You can also add a custom CSS styles if you do not want to use the ones that come with WP-SmugMug. WP-SmugMug also supports a custom template page when using the WordPress Link Destination. If a file named single-wp-smugmug.php or page-wp-smugmug.php is present in your WordPress theme directory, WP-SmugMug will that template when displaying the WordPress gallery page for your Post or Page. A custom post or page gallery template is useful if you want to display a large photo from SmugMug that would not ordinarily fit within the width of your regular single post or page template. WP-SmugMug 2 is compatible with previous versions of WP-SmugMug. For all of the latest features, however, you should use the WP-SmugMug shortcode in the future. I updated a caption on my SmugMug gallery, but WP-SmugMug is still showing the old caption. WP-SmugMug uses SimplePie to retrieve feeds. The default cache time is 12 hours. You can change this by adding some parameters to the end of your feed url (i.e. &x=1). 2.0.2: Specifying num attribute to limit the number of displayed images now works properly. 2.0.3: Fixed incompatibility with html entity decoding on PHP4. Fixed html bugs and added #wp-smugmug html fragment for paged galleries. Disables previous versions of WP-SmugMug. 2.0.4: Added Next/Prev buttons for WordPress gallery style. Fixed bug with WordPress flushing rules. 2.0.6: Fix for SmugMug image permalink structure changes. 2.0.7: Fix for SmugMug RSS feed changes. Removed support for WordPress gallery. Support for galleries larger than 100 images. 2.0.8: Fix for parse error bug when displaying link to gallery. is there a reason the recent galleries rss thumbnails wont show? I haven’t updated the plugin to support recent galleries, which didn’t exist when I wrote the original version of WP-SmugMug. The feed is in a different format than the normal galleries. Absolutely love the WP-SmugMug plugin. Its the simplest way for me to update galleries across a number of sites… at the same time. I have one question though. Is there a way to put a link in my SmugMug caption and have it show up as a linked caption when viewed through the lightbox on my site? I’ve tried a few things but the caption fails to show as a link. This would be a HUGE feature if there was a way for the plug-in to realize the caption from SmugMug had a link and showed it as a link. Lightbox grabs the value of the title attribute from the image (or link). I believe that WP-SmugMug strips out HTML in those attributes, which is why the links in the captions aren’t coming through. It’s also possible that your lightbox plugin is doing the stripping. I’ll look into this for a future release of WP-SmugMug. Adam – Thanks for the quick reply. I’ve tried WP-SmugMug with 4-5 different lightboxes and none show linked captions. I look forward to any updates to WP-SmugMug that do not strip HTML information from the caption. Again… great plug-in. Thanks for your hard work! Thanks for your plugin. On one site I am working on WP-Smugmug interferes with the Simple-Press plugin. Basically it 404’s every page in the Simple Press forum. I believe the issue lies somehow with JQuery. Is there any plans for an update? Glenn – Will have to do some debugging of this problem, as I haven’t encountered it before. I can’t seem to get the images to show, it just shows a link to the gallery. Is there something that I can do to fix this? Make sure the feed URL in your shortcode starts with http:// instead of feed:// ? is it only can retrieve 100 picture?…how bout if i have 150 pic???? any solution how can i retrieve all the pic and not being limited…. Try setting the ImageCount parameter in the feed url. yeah, i already changed it through hardcode, but still only can get 100pic max…any solution? You need to set both the ImageCount parameter in the feed url and the Number of Photos to retrieve in the shortcode. Let me know if that works. Lucky – Can you send me via email the link to the gallery you are trying to access? Trying out the plugin with Lightbox and it works great! Is there any way of removing visitors ability to download the photo? Alan – No way to prevent visitors’ ability to save the photo from within the plugin. Plus, if you disable easy sharing in your SmugMug gallery settings, you won’t be able to see any photos at all using WP-SmugMug. Same as Hunter…I’m only getting one column down the left side instead of rows. How can I fix that? thanks! This seems a great plugin but… can I use you plugin with WP 3 please? Kevin and Hunter: It could be a theme issue. Can you try changing to another theme temporarily to see if the columns appear again? The other thing is that you might need to specify a different size for the thumbnail images. From Thumb to Tiny. Marie – Yes, it should work on WP3. Tried it on WP3 installed on a site of mine.. seems to be working fine. Cheers. Hi, I am trying your plugin. I notice that when I click on a photo on your site smugmug is not starting, but instead the first photo is shown with the possibility to navigate. On my test site smugmug is started. what do I have to do to get the same result as you have? Is it possible to show images from rss with TWO words? Like Kasper + Solberg? Jan – Can you send me the [smugmug] shortcode that you are trying to use? Kasper – right now, the plugin doesn’t support RSS search feeds. I’d like to add this in the future, however. Well…. Then I’m happy to tell you that it actually DOES support search feeds (with only ONE word). You say that the wp-smugmug feed cache can be controlled by setting the MAGPIE_CACHE_AGE value in your wp-config.php file however this is not a default setting in a wp-config. Can you elaborate on exactly how to do this or is there another way to clear my feed cache? Where XXXX is the time you want the feed to be reservist. That said, I noticed that MagPieRss has been deprecated in WP 3.0 so I might be swapping it out in the future for SimplePie. Until then setting the pref should do the trick. I have the same problem than lucky, when I click the button “save” the number return to 100 and I need at least retrieve 201 pics. Hi Adam, I’m transferring a Flash-based site to WP 3.0.1 and would like to use your plug-in, but when I go to install it, it gives a message that it hasn’t been tested on this version of WP. Will there be any issues, or will it work just fine? Thanks! Can you use this plug in to show the images as a slideshow instead of just a gallery? So it automatically runs through the images without having to click on each one? I am running into the same problem as Lucky. Can only show 100 pics. Any solution to that. Also what light box pulgin are you using on this page. I installed the one from the link and it looks different and you can’t right click save. Has anyone encountered problems with thematic based themes? It seems to reset the css so the ul/li are all defaulted. My gallery shows up only as a column and not as rows, just like Hunter and Kevin. The problem shows up in every theme and in every configuration of your plugin. I’m using WordPress 3.0.1. Have you tried using a smaller thumbnail? Instead of the regular thumbnail, use the tiny thumbnail? It could be a CSS issue. I will have to look into it. What theme are you trying to use? Hi Adam, and thank you for replying. I’m using a modified theme, but this happens no matter if I use the default theme or tiny thumbnails or any other setting..
I’ve noticed that the images are displayed into an list, and I think this is the cause of why this happens. There is a way to remove this listing ? 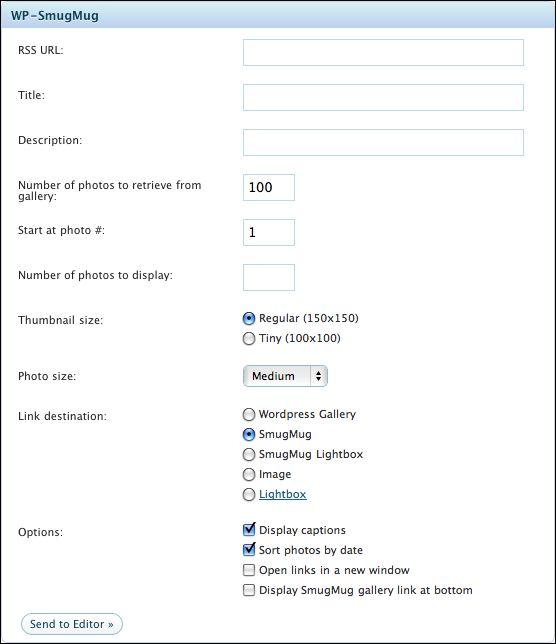 WP-SmugMug formats the gallery in a list; there is CSS that tranforms it into rows and columns of floated list elements. I have a feeling there is a CSS rule in the theme which is messing things up. Unfortunately, I don’t have time at the moment to track this down. I’m sorry to read that. When adding a “custom post type” entry, wp-smugmug does not appear in the editing panel. What and where would I edit to make this happen? WP-SmugMug was written before custom post types were available, so I need to find the hook to enable you to do that. I’ll put it on my to-do list. In the meantime, you can create the shortcode yourself from an existing post and copy and paste into the custom post. You can also set your defaults in the WP-SmugMug admin page. Then, all you really need to do is specify the feed url within the shortcode. Does this plug-in work for video? This is so hard for me! Since the author doesn’t have the time to fix the plugin, and there is no other plugin with this functionality, would anyone suggest me someone able to fix it for me? I’ll pay money! oh, forget it. I’ve hired a programmer. I have photos of old toys that I am selling in Smugmug. The photos come in WP fine however I want to be able to add a shortcode under each photo to display an Add to Cart button. If I added the shortcode in the smugmug comments , do you think it would carry over & work in WP? I don’t think that will work, due to the way WP-SmugMug currently formats the caption. is there a way to have the caption at the bottom of a photo (I’m using WP-Slimbox2) link to a photo’s smugmug page, rather than just a small jpg version of the photo hosted on smugmug? That’s hard to do at the moment. The value of the caption hyperlink is the same as the Link Destination. I’d have to decouple the two in order for what you want to work. I guess the behavior of clicking the pictures opened in the lightbox (using slimbox2) is governed by the lightbox plugin itself? I have tried other light boxes and galleries but to no avail. Any ideas? This plug-in is just what I was looking for! Great job. I am using this for my Project365 on my blog site and found one issue that I would like to resolve, if I can. The refresh rate of the feed : I now this was mentioned earlier up a few posts, and I am running 3.0.4, so the MagPie is no longer aviliable. Odd that I’m running 3.0.4 and the plugin is working. I know that MagPie is on its way out, but didn’t know that it was finally removed. Replacing MagPie with SimplePie is going to take a little more work than changing a few lines of code. Will look at it soon. hey Adam, cool plugin. but did u ever happen to get the thumbnail to show up for the galleries? i have 6 galleries so i want those to show on my page, but right now it just shows the title of the gallery in place of the thumbnail, with the same text under it as the title. thanks for the help! Thanks for this. I did make one change to my install so that it was consistent with the way I use my web site. For each image gallery I often use one embedded image in a post as a link to the full gallery in lightbox. Clicking on the one thumbnail loads all the images in lightbox. I’m having problems with the 100 photo limit as well though. Any fix that will allow me to show an unlimited amount of images? Chris – thanks for catching this. That option has always been a little buggy. Will look into it when I have a moment. hi, thanks so much for your work. coders like you make it easy for me to goof around with web design in new ways. secondary request/question may not be for you but rather a jquery lightbox dev, but is there a way for the image info that is displayed to be the tags i have set in smugmug? i tend not to caption photos, and i tend not to use filenames, but i do attempt to have pervasive tagging. Im having the same prob. Would like to display more than 100, but cannot get the plugin to retrieve more than 100. Even if I ask for a 100 photos, but from images 150-249, still will not work. I’d love to have all images displayed. Other than that, awesome plugin! ok one more comment/question. i tried about 10 lightbox plugins, and cant find the one that you use on the “lightbox” option on your demo set of photos above. do you mind disclosing which specific lightbox version you use? its snowing mega mega blizzard style here! plenty of time to do web design! Shane, you’ve tried the &Paging=0 thing? Thanks for this plugin that seems to be great. I’m wondering if someone know an easy way to allow user to choose the size of images – like with a widget – that will be then sent to smugmug through url. Maybe my question was not very clear :) I don’t speak about user of the plugin … there is a box for this to choose size … I would like to use everywhere in smugmug links generated by plugin a size defined by visitor of the website, for example using a widget. One thing that I had a bit of trouble working out was the URL of the RSS feed gets defaulted to start with “feed://” in Safari, instead of “http://”. Although you mentioned this in a previous comment, I think it would be worthwhile mentioning this in the instructions. but right now it doesn’t support recent gallery rss feed…. …any word on when you’ll work your magic and add that option? It would be nice if we could have further custom values for the size of thumbnails. I am trying to use the short code in a template. This works great! However, I need the images to display one on top of the other vertically instead of horizontal. Is there some way to accomplish this? I tried repeating the shortcode in the page template but that does not work. Is there someway to repeat the short code on a page more than once? You should be able to repeat the shortcode on the same page. No way to configure the display to be horizontal or vertical. You could make the image display to be larger so that it forces images to be on top of one another, but that’s more of a hack. Maybe a future version will address this. WP-SmugMug doesn’t support galleries at the moment. Maybe in the future. It is not showing anything in my editor or code.. I, like Samir (commented back in Feburary), am interested in knowing what Lightbox plugin you are using to get the nice, clean effect on your sample images – specifically those used in the “Image File” and “Lightbox-view of the photo” samples. Would you mind sharing the plugin (and any related config info) that you used to get this nice effect? I use FancyBox for WordPress. Adam, please help! Smugmug rolled out a new URL structure on thursday and all new photos added to a gallery just show up as broken links with your plugin. Not sure what the fix is, but we need help! Colleen: Please update to 2.0.8 (just released this), and let me know if the parse error resolves itself. I had to rewrite the engine that fetches the feed in version 2.0.8, using SimplePie instead of MagPieRSS. Unfortunately, this has the effect of increased memory usage. Not sure if this is related to the previous issue, but I just noticed today that one post that had been working no longer is. The error is “Fatal error: Call to a member function get_thumbnail() on a non-object in /home1/coastal2/public_html/aaronpriestphoto/wp-content/plugins/wp-smugmug/wp-smugmug.php on line 395”. If I remove the WP-SmugMug link from the post, then the page loads fine with all the previous posts also loading fine. As soon as I add that one gallery link back the page hits that error and stops loading any previous posts below it. I’ve got WordPress 3.1.1 and WP-SmugMug 2.0.8. I upgraded yesterday to 2.0.8 and this morning I saw that my photos order in my galleries changed, it got reversed, the lasts photos are now showing first, which is not something I want. Is there something I am missing (new option somewhere? ), is there a way to put it back like it was before? Fantastic plugin. I just found smugmug’s “slideshow” feature last night. Any chance you’ll be adding this feature to the link destinations options in the future? I’m wondering if I can somehow use this to have a feed of images appear in my sidebar? I know this is not a widget, but can I get it to load small thumbnails into my sidebar using an html widget? I really love the plugin. However my thumbnail gallery stooped working around the time I moved to 2.0.8. I reinstalled 2.0.7 but still cant load the gallery page. How did you get 2.0.6? Where could I get it? We’ve been trying to integrate the smugmug plugin and get the same line 395 error. I’m noticing dozens of websites are having this error, so it seems there’s a bug with 2.0.8. I’m releasing a new version of WP-SmugMug which avoids this problem. Let me know if it works. Will be up shortly via WordPress upgrade. I’m getting an error on my website when I view more than 4 posts on a single page. The new version of WP-SmugMug uses a different RSS parsing mechanism which isn’t as good with memory management. Keep the number of galleries displayed to less than 4 (sometimes 3). On another blog it works fine. Any ideas? In regards to the above error, I should mention, that by switching back to 2.0.8 my problem was solved, so for now I’m just staying there, but would like to stay current if possible. I know you gave a brief explanation at the top of this blog page about how to reduce the cache time when updating new photos, captions, etc. Can you go into more detail about that? For instance, when I add a new photo to SmugMug, is there a way for the update to happen automatically when refreshing the gallery page on my WP site? Even if it can’t be instantaneously, what’s the quickest it can be set to update the cache and how do you do this? Any idea what is going on? This will repeat down an entire page before I see the pictures I’m pointing to. I think the plugin is great and it looks really nice on your website. What do you use to make them pop-out from the webpage when you select image? Mine just goes to a blank webpage with the image displayed. hrm, I just updated and noticed your CSS for this seems a lot different than 2.07. It totally broke me. I’m pretty sure it has to do w/ the theme I’m using (autofocus+ pro using thematic). This is w/ 2.0.9 and 2.0.8. I’ve been using 2.0.7 and hadn’t noticed the updates, but it still works fine for me. Basically, it turns the thumbnails to a long bulleted list. I’m going to respond to both of you. I’m traveling at the moment, so I don’t have time to debug this problem for you. I have plans for improving the plugin, but it’s going to come by mid-June at the earliest. Sorry for the inconvenience and thanks in advance for your patience. I’ll be in touch with both of you directly when I have something for you to check out. no biggie, it’s awesome enough that you even have this or else I wouldn’t even have this, heh. somehow it started working and I have no idea what I did. It also went ahead and upgraded my version of php from 4 to 5 so I can use more plugins. I really like your pictures on this page. I would love to know what you use to make them pop-out of the page instead of displaying on a different page. Great plugin and I love that it works with my smugmug galleries. I just got a chance to dig around some, and I’m certain the issue is my themes css is taking precedence. I have to tweak the spacing (that’s a given), but I think if I just force your css to take priority, I should be good in theory. Great plugin. How do I create more space between the thumbnails in the gallery? I want a little bit more cushion between the thumbnails so they’re not so close together. Thanks for all your great work! I’m using your plugin with Fancybox. It seems to work just fine. The captions from the SmugMug images appear below the thumbnails on my page. I’d like to get the same look you’ve created above: thumbnail gallery with captions that appear only when a user clicks on the image and sees it in a lightbox. When you have a moment, please let me know if you think this is a CSS issue on my page or another issue. Thanks! Ok, so the less/greater than brackets don’t show right… but basically my output has and then my title. Adam – wouldn’t you just know it. I’ve changed my theme to one I’m very happy with and now your plugin doesn’t function properly. The problem is that in the editing mode, I can’t get the RSS feed to insert into the post. I’ve had to resort to copy and paste from previous posts; changing just the RSS feed url. Of course, I’m frustrated, but I also know that since it’s theme related, you probably can’t do much about it. The thumbnails show up just fine once I copy in the shortcode. Any suggestions – besides changing themes??? Scratch that. Widgets on right side are forcing wp-smugmug to be below widgets. I deleted widgets and thumbnails are aligned on top now. Is this a limitaion of wp-smugmug? Is there any way to include the “share” buttons associated with smugmug into my site using the plugin? It works great embedding the galleries but the “share” buttons are missing when opened in lightbox or any other option to view a single image. I am testing out this plugin, and I really like the concept. The problem is, even though I have installed a wordpress lightbox, I am unable to get the gallery to use it. It always defaults to showing the actual image, which is less than ideal. It seems your plugin is the best so far i tried all of them, but meanwhile i’m having the problem in pages. if you have for instence 50 pictures to dispaly but you set “Number of photos to display’ to 9 it only display 9 pictures. Im using Lightbox plus plugin for the galerria but it’s not showing the rest of the pictures i mean all the 50 it shows only 9. Another question if i want to put facebook and twitter like button in the lightbox is that possible, is there any lightbox that comes already built with it? What if my smugmug gallery grows beyond 100 photos? what suggestions or help can you offer? Thank you! and your WP-SmugMug is the life of my website! Help oh help. I have searched forums for hours – I have installed the WP-Smugmug plugin. It is activated, and all I get is “click here for images” when I put the shortcode in. Why isn’t it giving me the galleries? adding the &x=1 argument to the end of my rss feed url does not seem to update the rss feed every hour but still 12 hours. how can I fix this? I would like to customize what is above each photo when viewing the photo’s in the lightbox view. It currently grabs the value from the “FirstName” field in SmugMug’s Account Settings, and then it add ” ‘s Photo “. So if i put the value “Client” in the first name field, then ” Client’s Photo ” would display above the photo. I would like to hardcode a value instead, but I cannot find the code that is handling this in either of the files available for me to edit. Any help with this would be appreciated! Fantastic plug in. Is there a fix for gallery size? I’ve noticed that galleries over 500 photos in size tank WP. Is this a fail on the plugin or a fail of WP? Hi! Not sure if this plugin is supported anymore – I suspect not – but maybe anyone can point me in any helpful direction! I have a very weird problem: I input the RSS feed link and the thumbnails show up perfectly when I preview the page, BUT, the moment the page is refreshed I get a lot of broken links ( the dreaded question marks)! Anybody have any thoughts, any at all?!? And, no lightbox feature either! Hi MB! Your Myrtle Beach Golf site looks brilliant!! Hey thanks a bunch for your kind offer to have a look! I actually got it working :) Silly enough, I had a couple of galleries set at “no external linking” and that’s what was breaking the links – the part that really threw me is that they would show up fine until a refresh!?! Oh and I also got the lightbox working and if anybody needs help I “might” be able to point them in the right direction! What a great plugin!! I’m looking to integrate all of my SmugMug galleries into WordPress, and want the page to not show recent individual pictures, but the gallery links. Is there anyway to do this? I also tried this for the first time recently and am seeing broken image links in the Preview view of wordpress. switched thumbnail size to TINY and it worked. but then it failed again… what’s going on here? changed gallery setting to allow external links and now it’s fine! Will there ever be support for having a “buy prints” link in the lightbox or below the image(s)? Either your examples are misleading or I have not configured the plugin correctly: if I select Link Destination “Image File” should it show me a slide-show (as in your example) or just a single image? Thanks for the plugin. Unfortunately, I’m not that computer savvy and don’t really understand what paramiters I need to enter, to integrate SmugMug and WordPress. Hi Adam – I just upgraded one of my blogs to WP 3.4.1 and now your plug-in seems to be breaking my site. I removed all my plug-ins and added them back in one-by-one and all was fine until I got to the last one, which is your’s. I’m not going to update any of my other sites until I can figure out a fix or replacement plugin. Have you encountered this problem and do you plan to upgrade your plugin to work with 3.4.1? What kind of error is it giving you? I love the possibilities of this plugin and the demos to working sites. The issue I’m having is that instead of a gallery, I get a link to the gallery. I’m using the link Smugmug creates, I’m sure it’s a public gallery and changing it from feed to http, but still no success. Any ideas? I’d be happy to provide more details privately as the gallery isn’t ready for the world, yet. Adam: My bad – it’s working fine. I just forgot that I had changed the domain name at SmugMug so all the RSS feeds needed to be updated. Sorry! Ohmygoodness!!! You are an answer I’ve been LOOKING for…thanks SO much for you work. I hope you never get tired of hearing the thanks. 1) is there any way to get rid of the names below the thumbnails? 2) i’m a rookie, but how do I get back to my other pages (get out of) the smugmug gallery once I’m in there? Add captions=”false” in the shortcode to remove the captions. Check the “open links in new window” button. This will open a new window/tab instead of using the current window. Thank you so much. An amazing plug-in. Does this always work for video clips that you have on SmugMug? Also, sometimes when I click “Send to Editor”, nothing happens. Any suggestions? great plugin. But you know what would make this plugin ESSENTIAL for me, and many other photographers, is if you added facebook, twitter, and email buttons to the large previews of individual images. I wirelessly/ instantaneously upload images to smugmug as they are being shot and have clients viewing the gallery online as it is populated. It would be great to do this through my website and give clients the ability to share those images almost as instantly as they were shot. Love how easy the plug-in / short code works. One thing I have a question about is a “video” thumbnail. We have a smugmug gallery that also has video (smug mug now supports video). If there is a video in the gallery, WP-Smugmug returns an empty placeholder with no thumbnail and no link. If you view the RSS feed directly, there is a thumbnail for the video in the feed. Hey, love the plugin. I was wondering if there was one more thing I could do with it. I’m currently using it to pull 9 photos into a display on a client’s site, but I’d love it if it could grab 9 random photos out of the Smugmug gallery in question instead of starting sequentially at photo #1. Is there any way to do that? For the record, I’m using the <?php echo do_shortcode call directly in the template instead of a an actual shortcode. No the plugin does not work with private galleries. Great plugin, been using it for years. Now upgrading to a responsive website. I would like the thumbnails to be a percent. Can’t get them to be other than 100×100 or 150×150. Any way to override those two options and make the width a percent and the height auto, or same as width? Brandon – been meaning to update the plugin, but haven’t had the time unfortunately. There’s no way to override those options at the moment. Already did it actually, just overrode it with CSS. Thanks bud! I am using WP-Smugmug All of the galleries are populating except the main page all subs are working. I want to include the main with the Smugmug home page content. Is that possible. Robert: I haven’t updated WP-SmugMug in a long time, and the company has changed a lot about its API. It’s certainly possible, but not with the current version of my plugin. It would require a complete rewrite of the plugin. There may be some other WordPress plugins that interface with SmugMug that do what you want. Is there a way to show multiple galleries with only that one shortcode you have? No, and I haven’t updated the code in a long time, so there’s no guarantees that it actually works with SmugMug and WordPress today.